Three reel pokies are less common nowadays, but the very first slot machines had three reels and some of the best, modern pokies games stick to the traditional format. Five reel pokies are generally more readily available, both online and offline, but leading gaming software developers have taken advantage of the simpler 3-reel format to create innovative pokies games that bring the classic format up to speed. If you head to any of the leading online casinos recommended above there will be a selection of three-reel pokies games available to choose from, but the few outlined below are our absolute favourites. This little slots game sticks to the traditional fruit slots theme that 3 reel pokies games are famous for. Pub Fruity only has eight different icons, and there are nine different possible combinations that can be won. 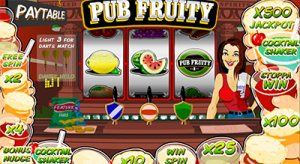 If you’re lucky enough to get three Pub Fruity icons in a row your betting amount will be multiplied by a whopping 250! There is also a Darts Contest Bonus Game where you can win a 1000 times bet multiplier, all you have to do is pick who you want to enter the dart contest for you and cross your fingers that they win. There is also a Drinks Trail Bonus Game that is triggered automatically. In this game the trail of drinks will randomly light up for a number of drinks and where the light stops determines the win. In the Drinks Trail Bonus Game you could win; x2 multiplier, x4 multiplier, a free spin, a reel nudge, a free second go at the Drinks Trail Bonus Game, x25 multiplier, x100 multiplier or a x500 multiplier. Cash Splash is a 3 reel progressive jackpot pokies game. 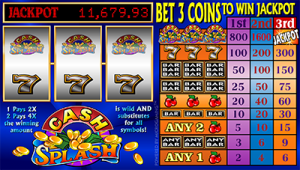 In this game the CashSplash icon serves as a wild multiplier symbol, it can multiply the payout when there is a winning combination or it can spin one reel if only one reel if two icons are making a winning combo on the other two reels. Cash Splash can be played at; Guts Casino, G’Day Casino, Royal Vegas Casino and 7Sultans Casino. Remember: Cash Splash is a progressive jackpot game, so the amount up for grabs will vary from site to site and from day to day. This pokies game is totally different to what you would expect from a 3 reel slots game; it’s not traditional or pub or fruit-themed. 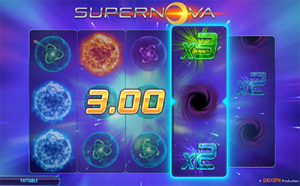 Supernova is one of the most soothing slot games we’ve played. It is outer space themed and has a calming musical backing track. Supernova has incredible graphics – uou can definitely tell this is a modern and innovative slots game. Even though there are only three reels the game pays 27 ways. Anytime you have a winning combination on the main three reels, two reels on the side will be activated. The two side reels give you the chance to multiply your winnings by; x2, x3, x5, x10. You can elect to autoplay in Supernova which will automatically spin and collect your winnings for you for a set number of rounds. Supernova can be played at Guts Casino and G’Day Casino. Three reel slots were the first format for the original slots machines. The first ever video slot machine was invented by Charles Fey in the USA in 1887. It had three spinning reels with five symbols on each of these reels. On Charles Fey’s slots machine any three symbols in a row would award some kind of payout. Fey’s 3 reel slots machines were seen in bars and hotels all over San Francisco and Chicago. The first real video slot machine was created in 1976 and then the first online slot games were created in the 1990s. These two advances drastically changed the types of slot games on the market. Now you can play a great variety of games that are quite different from the original 3 reel format. You can now see slot games that are closer to arcade video games and there are endless themes available. At land-based gambling establishments, three reel pokies are somewhat of a rarity – five-reel gaming machines are the most widespread type now. In the online casino world, video slots are arguably the most popular and the most common, but there are some really exciting 3 reel online slot games out there that make the most of the simplified slots format. What is the difference between 3 and 5 reel slots? The extra reels in 5 reel pokies means that are more possible combinations that can be spun. Theoretically it is harder to land a winning spin in 5 reel pokies than 3 reel pokies but often there are many more pay lines in 5 reel games. You’ll need to check out the payout rates for your individual video slots as there are no steadfast rules for 3 reel or 5 reel games being more rewarding. 3 reel pokies games typically have less pay lines. For new pokies players, this can make the game and the systems of payouts easier to understand. 3 reel pokies are harder to find if you prefer gambling at brick-and-mortar casinos or other land-based gambling establishments. This isn’t necessarily a bad thing though, as online casinos generally have higher payout rates than offline casinos, as well as a better selection of games and the added bonus of being able to play from the comfort of your own home. Aside from the difference in the number of reels, in general 5 reel pokies games are more complex than 3 reel pokies with more bonus games and other interactive elements. Where can I play three reel pokies? It’s hard to find modern slot machines that only have three reels, but online there are plenty of three-reel slot games available. All of the top-rated online casinos recommended in our casino table above have at least a couple of three-reel slot games available to choose from, and usually have a category of their own to make it easy to find these classic titles. Our endorsed virtual casinos are all tried and trusted, so you can rest assured that they are safe if you want to play slots for real money. Each utilise a minimum of 128-bit Secure Socket Layer digital encryption technology to safeguard your funds and personal details from any third parties. Looking for excellent online casino to play three reel pokies games? We recommend Slots Million for its extensive game catalogue and user-friendly interface, where new players can redeem up to $100 worth of welcome bonuses upon signing up and depositing real money for the first time.